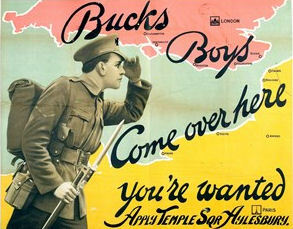 The local recruiting centre for Bucks volunteers was in Aylesbury, but in 1914 the existing Regulars of the Oxon and Bucks Light Infantry were first to see action soon after war was declared on 4th August. Most subsequent volunteer soldiers recruited from Swanbourne also joined the Oxon and Bucks Light Infantry. In Swanbourne, Thomas Francis Fremantle (Lord Cottisloe), was Colonel of the Bucks Battalion Territorial Army, and is said to have appealed for recruits from the village to join the war effort (Reading, 1994). In August 1914, the 2nd Oxon and Bucks arrived on the Western Front, as part of the 5th Infantry Brigade, 2nd Division, I Corps. The 2nd Division was one of the first divisions of the British Expeditionary Force (BEF) to arrive in France. The battalion took part in the first British battle of the war, at Mons, where the British defeated the German forces that they had encountered on 23 August. The battalion subsequently took part in the 220 mile retreat (in exceptionally hot weather) that began the following day, not stopping until just on the outskirts of Paris, then halting the German advance at the First Battle of the Marne (5–9 September). At sea, on the 24th October, 1914, the destroyer Badger under the command of Commander C. R. Fremantle (nephew of Admiral Edmund Fremantle) rammed and sank a German submarine off the Dutch coast. 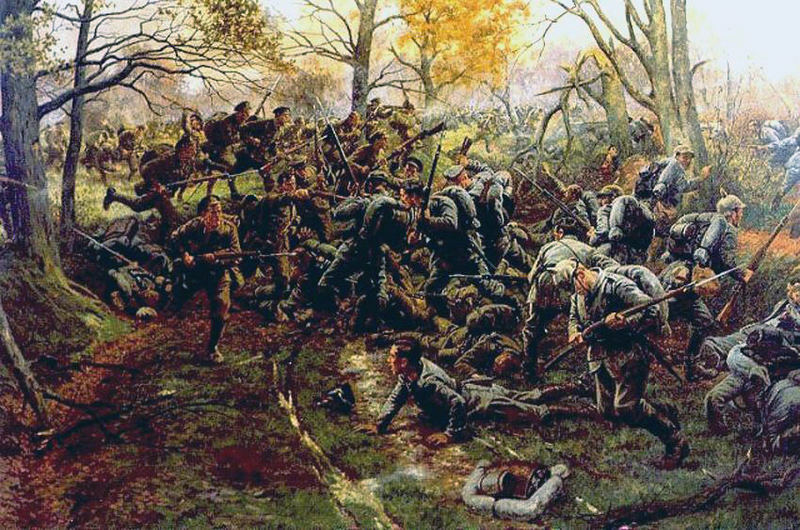 The 2nd Oxon and Bucks later took part in all the subsidiary battles of the First Battle of Ypres (19 October – 22 November) which greatly depleted the old Regular Army, with 54,000 casualties being sustained. 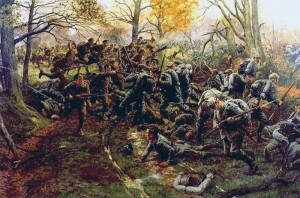 The 2nd Oxon and Bucks first engagement of the battle was on 20 October in an attack on the Passchendaele ridge. The battalion had heavy casualties: 4 officers killed and 5 wounded and 143 other ranks killed or wounded. 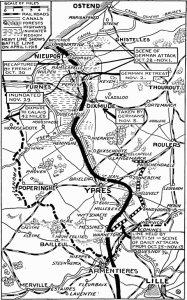 On 31 October the Germans launched a large scale attack against General Sir Douglas Haig‘s I Corps in the area of Ypres, which commenced with a heavy bombardment followed by a mass infantry attack. Two companies of the 2nd Oxon and Bucks took part in the defence and subsequent counter attack which forced the enemy back to their front line. The German army at the time was a collection of regional forces organized by the various German states with the Prussian army being the dominant part. The German General Staff were mostly German nobility with ‘vons’ in front of their names. However, Bucks men fought opposite the Bavarian Army which included in its ranks a young Adolf Hitler (a volunteer in the 16th Bavarian Reserve Regiment). Hitler’s primary duty was as a message runner on the Western Front. 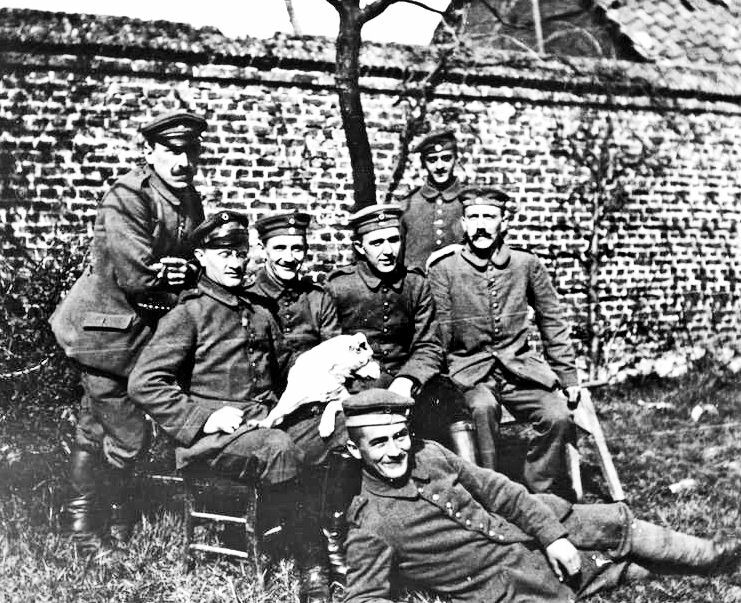 A young Adolf Hitler (right) with comrades of the Bavarian Army who faced the British in the Ypres salient. Hitler was present at a number of major battles, including the First Battle of Ypres, the Battle of the Somme, the Battle of Arras, and the Battle of Passchendaele. The Battle of Ypres (October 1914), became known in Germany as the Kindermord bei Ypern (Massacre of the Innocents) and saw approximately 40,000 German men (between a third and a half) of the nine infantry divisions present killed in 20 days, with Hitler’s own company of 250 reduced to 42 by December. Painting showing the 2nd Oxon and Bucks defeating the elete Prussian Guard. 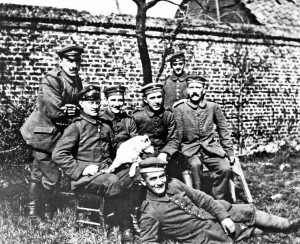 On 11 November, 1914, the Germans made another attempt to capture Ypres, when the German Kaiser sent in the elite Prussian Guard against British forces. The 2nd Battalion launched a counter-attack at Nonne Bosschen wood, preventing their advance and then routing them. First Ypres was the last major battle of 1914. The 2nd Oxon and Bucks sustained 632 casualties during the first five months of the war and by 1915 it was a somewhat different battalion from that which had arrived on the Western Front in 1914. Back in Swanbourne, the village ladies organised collections to raise money for our soldiers overseas. The lessons of the Boer War had (to some extent) prepared the Regular British Army for modern warfare. The German advance towards Paris in Northern France had been halted. 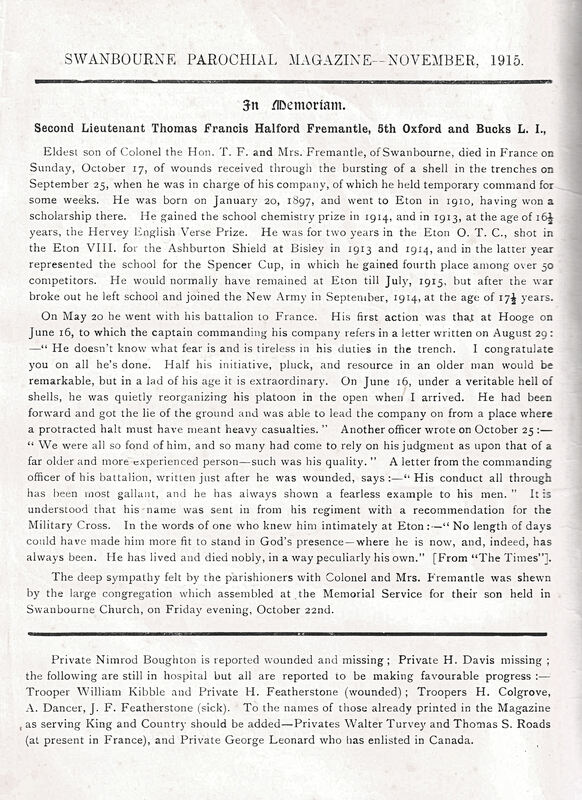 Lieutenant T. F. H. Fremantle, heir to the Swanbourne Estate, served in the 5th (Service) Battalion, Oxon and Bucks Light Infantry. With his father a Colonel in Territorial Army, Lieutenant T.F.H. 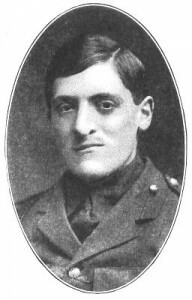 Fremantle had left Eton school a year early, joining the army at the age of only 17. The 5th Service Battalion had been raised at Oxford in August 1914 as part of Kitchener’s First New Army, joining the 42nd Brigade, 14th (Light) Division. After training they proceeded to France, landing at Boulogne on the 21st of May 1915. They saw battle at Hooge, being the first division of soldiers to ever be attacked by flamethrowers. In 1915 the trench warfare continued with both sides further developing impregnable defences leading to high casualties in return for minimal gains. The Battle of Festubert (9–16 May) was launched in support of the French attack south of Vimy Ridge. The 2nd Oxon and Bucks were part of the second wave of the 5th Brigade attack and during the course of the battle suffered just under 400 casualties. The 2nd Oxon and Bucks were involved in heavy fighting at Richebourg l’Avoue on 15–16 May, and they also saw action at Loos (25 September – 8 October) as well as taking part in the subsidiary attack at Givenchy (with 263 casualties) on 25 September. The 2nd Battalion also took part in the subsequent attack against the Hohenzollern Redoubt (13–19 October). Following the battle of Loos, few pre-1914 2nd Oxon and Bucks officers remained. They had either become casualties or promoted to take up positions in other battalions. The gallantry awards made to members of the battalion for bravery during the battle of Loos included the award of the Distinguished Conduct Medal. On 25th September, Lieut. T. F. Halford Fremantle was seriously injured when an enemy shell burst in the British trenches. On Sunday, 17th October, 1915, he died of his wounds. Halford was only 18 years old. 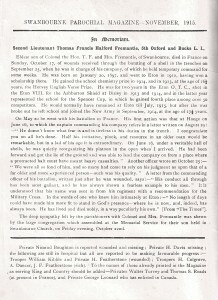 Read detail in PDF format:- In Memoriam Notice in Swanbourne Parochial Magazine to LIEUTENANT T. F. HALFORD FREMANTLE , November 1915. 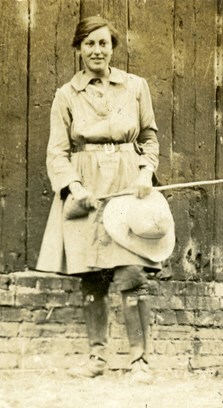 Florence Fremantle was the 17 year old sister of Lieut. T.F.H.Fremantle. His early death in battle had a profound effect on this 17-year-old girl. His loss made her more determined to serve the war effort. So when the Board of Agriculture organised the Women’s Land Army, she joined. 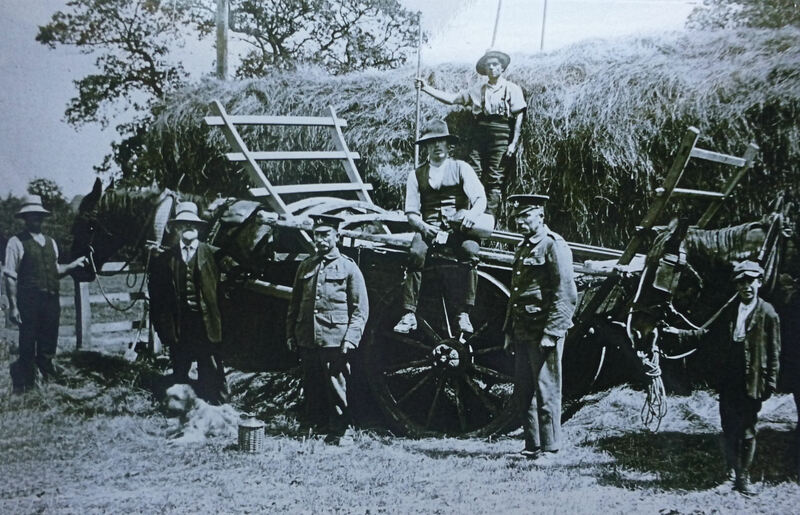 As one of 23,000 across the country who volunteered to fill the gaps left by men who had gone to war, Florence felt she was honouring Halford’s memory, as well as helping food production for her country, which was struggling for labour. 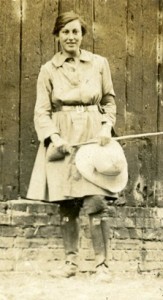 She was sent to Brockhold Farm, in Hertfordshire, where she relished the outdoor life. It was not long before her fellow ‘Land Girls’ got to know of her ‘well to do’ background, but she was known simply as Florence. She started writing poems and songs, and began sketching and painting. She was asked to write a girls’ Land Army song to encourage national recruitment, which was widely received, and one of her poignant paintings is of war graves (1919), focusing on the place where her beloved brother, Halford, was buried. Continuing to serve good causes, after the war Florence Fremantle became a missionary in Palestine and Egypt, and later worked for the BBC’s Arabic News Service. In 1916 the Oxon and Bucks were on the Somme seeing action in The Battle of Delville Wood and The Battle of Flers-Courcelette. In 1917 they fought in The German retreat to the Hindenburg Line, The First and Third Battle of the Scarpe at Arras, The Battle of Langemark and The First and Second Battle of Passchendaele. In 1918 they returned to the Somme and were in action during The Battle of St Quentin and The Battle of the Avre, suffering very heavy casualties with almost 6,000 men of the Division killed or injured. The Third Lord Cottisloe inherited the Swanbourne Estate in 1918. He was determined to provide all ex-servicemen who had returned to Swanbourne a tenancy of land on the Swanbourne Estate. Subsequently, a number of smallholdings were eventually created for the small number of applicants. Most of his tenants survived in business until retirement when their land was returned to neighbouring larger farm holdings. 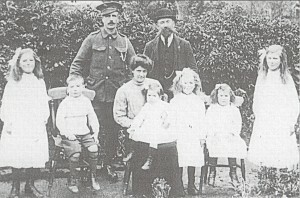 Jack Harding returns home to his family in 1918. 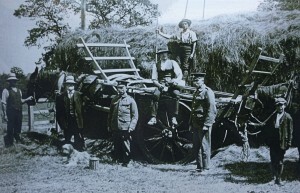 The Kibble family with two men in army uniforms – haymaking at Buxlow Farm, 1918. Vice Admiral Sydney Fremantle had been command Third Battle Squadron during 1915-1916, in the Mediterranean, and was part of the Dardanelles campaign. However, Sydney Fremantle is most remembered by an event after the end of the war. In May, 1919, he oversaw the internment of the German Fleet at Scapa Flow. The Squadron were at sea on exercises when the German Navy scuttled their fleet rather than allow it to fall into the hands of their enemies. Swanbourne men who had served and survived returned home and tried to resume their lives again. 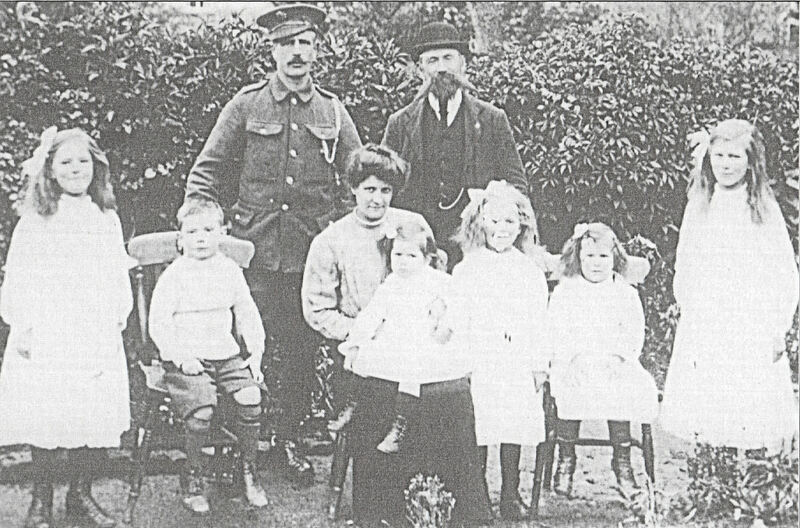 Records show that as many as up to 77 men who had been born or lived in Swanbourne had served in World War 1.